Stamina RX for Women Reviews - Does Stamina RX for Women Work? As a popular sexual enhancement product, Stamina RX for Women is intended to stimulate a woman's overall sexual interest, satisfaction, and desire. By using Stamina RX as directed, creators of this product assert that women will gain intensified orgasms and sexual pleasure. What is Stamina RX for Women? With Stamina RX's unique combination of effective aphrodisiac and invigorating ingredients, women should notice gradual sexual wellness improvements with daily use. Although the creators of Stamina RX assert that their product is safe and effective, consumers should be aware of the conflicting reports and reviews of this supplement. According to some informers, Stamina RX, along with several other Keltech Bioceuticals products, have been linked with various health risks and dangers. As some of Keltech Bioceuticals' products, such as Stamina RX, may allegedly contain an ingredient that had been previously used to treat issues associated with male sexual dysfunction. 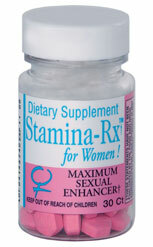 Some critics of Stamina RX are dubious of the product's label and title, as RX should only refer to prescription-grade products / ingredients; as such, those who question the safety of Stamina RX warn consumers that the label may simply be an attempt to boost the product's legitimacy, while others believe that the label reveals a deeper link to previously used prescription-grade and potentially dangerous ingredients. While the verification of Stamina RX's previous / past ingredients is not clearly reported, consumers should carefully evaluate the product's ingredients prior to consumption. Additionally, reports show that the manufacturer of Stamina RX has neglected to clearly inform consumers of the previous warnings pertaining to their product. As the manufacturers most likely re-invented and altered their formula after reports of former health issues and concerns, supporters of Stamina RX assure consumers that the new combination of ingredients is both safe and effective. Ultimately, as true with any type of dietary supplement, consumers should visit their physician prior to use.